When the owner of this lovely 60th Anniversary MIM Strat asked us to outfit it with an XR system we couldn’t wait! 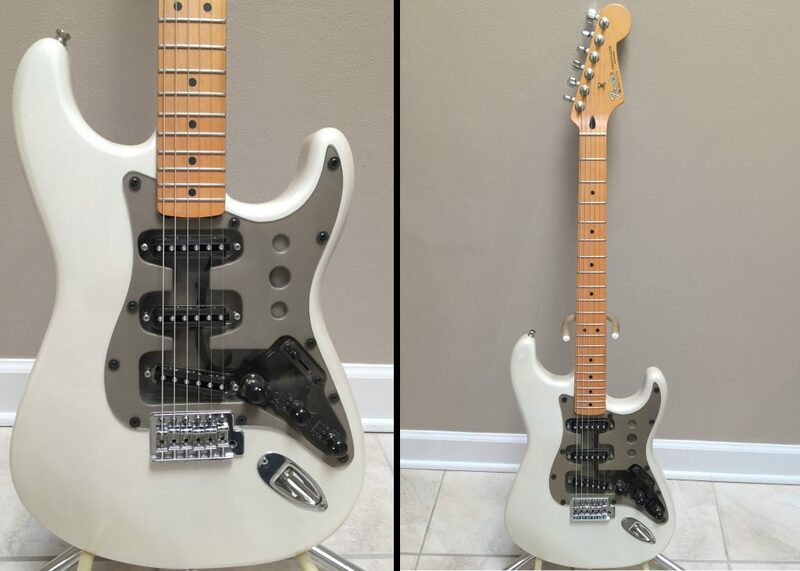 This particular iteration of the Strat didn’t stray far from the original design from 1954. It seemed fitting to upgrade it, and bring it 60+ years into the future to showcase the advances in technology since the days of the originals. Enjoy this visual tour of the installation and final results. Fender 60th Anniversary Strat in Blizzard Pearl finish after being equipped with a custom XR loaded pickguard. The guitar came stock with standard Fender single-coil pickups and a 3-layer pickguard. 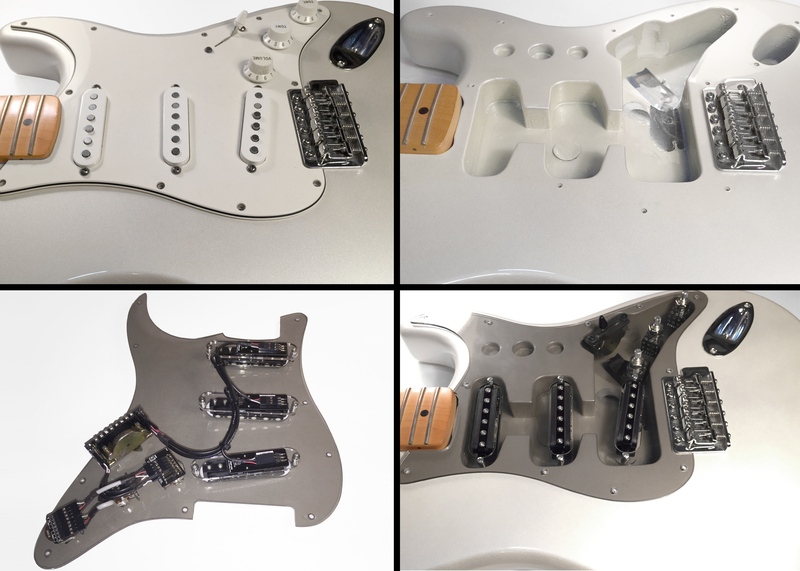 We held our breath as we removed the original pickguard in hopes that the control cavity wouldn’t need much touching up to make it ready for the new guard. Thankfully only minor touch-ups were necessary to prep it for the custom laser-cut clear acrylic pickguard. Per the owners request we had a tinting film applied to the rear of the guard for a sleek, modern look. The solder-free electronics help make the lead-dress nice and tidy as seen in the third image. Lastly we see the test fitting of the new XR loaded guard. 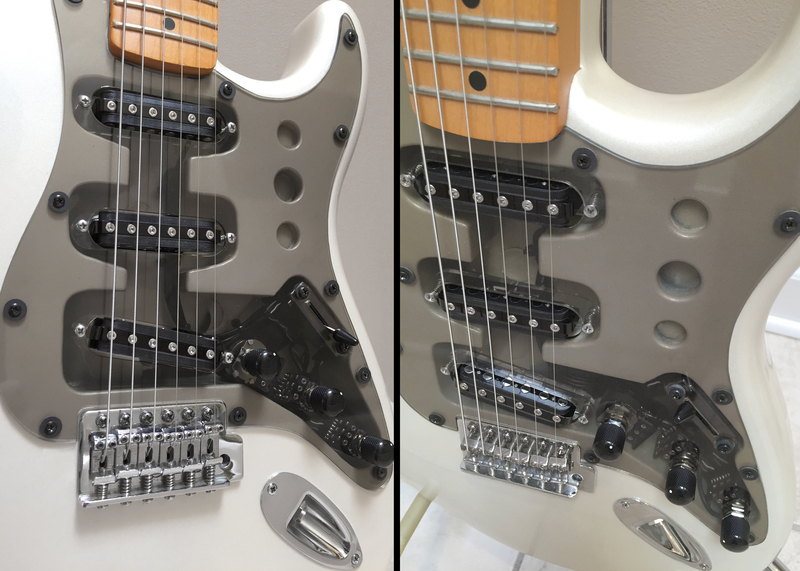 *Note – the connector on the bridge pickup is reversed because the owner wanted to experiment with out-of phase tones in position 2 (bridge & middle) of the 5-way selector. The guitar came together beautifully creating an industrial chíc look that the owner is thrilled with. Final touches include black knurled-metal knobs and fiber washers on the mounting screws to reinforce the industrial vibe that was captured with this build. Next post Skewed Lefty Anyone?